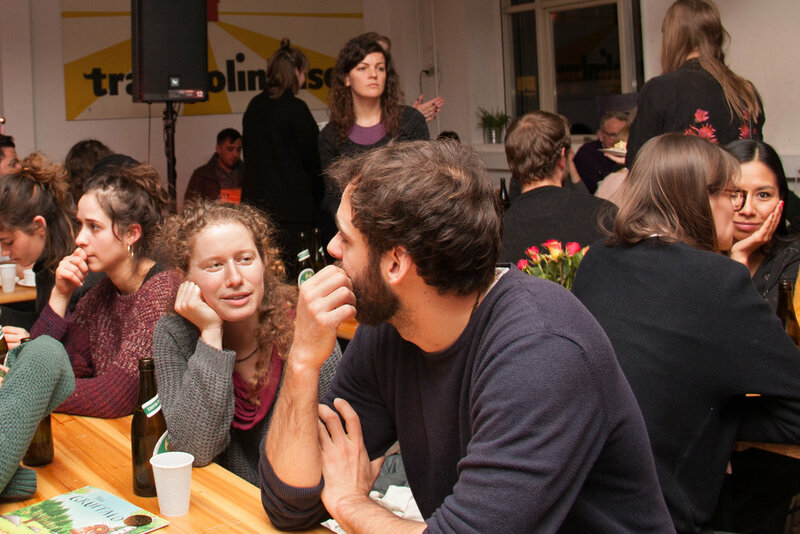 This week in Trampoline House, you can: Attend a meeting for the Rejected asylum seekers contact person network, participate in our new Ping pong workshop, join the Opening of the solo exhibition "Economy of Migrant Labor – for the Right to Work" by The Bridge Radio, and much more. OPEN AGAIN: Trampoline House's Tailor Shop is now open again – stop by this Tuesday or Wednesday from 1–4 pm if you have clothes that need to be repaired. NEW: Now you can join Trampoline House's new Ping Pong Workshop with David every Friday from 2–4 pm. PAUSED UNTIL WE FIND A NEW TEACHER: Unfortunately, we have to put Arabic (every Friday from 5–6 pm) on hold. We're working hard to find a new teacher – we'll let you know, once she/he is found. CANCELLED THIS WEEK: There will be no Cinema Club this week due to the Opening of the solo exhibition "Economy of Migrant Labor – for the Right to Work" by The Bridge Radio in Trampoline House's art gallery CAMP. WOMEN'S CLUB: Please note that the program for Women's Club (Saturdays from 2–6:30 pm) has a new structure. Click here to see our calendar. The full Spring 2018 program for Women’s Club will be available end of January. Women's Club is closed every first Saturday of the month. NEW EXHIBITION: From January 20 you can visit CAMP's new exhibition "Economy of Migrant Labor – for the Right to Work" – a solo exhibition by the transnational radio collective The Bridge Radio. The exhibition runs until May 19. CAMP opening hours: Tuesday, Wednesday & Friday 1–6 pm, Saturday 2–5 pm – free guided tours Saturdays 3–4 pm (closed every last Friday and Saturday of the month. Join us this Friday for the Opening event! This Wednesday from 6–9 pm, you can join a meeting for the Rejected asylum seekers contact person network. Rejected asylum seekers are forced to live at the deporation center “Kærshovedgård Udrejsecenter” near Ikast in Jutland. Many of them wish for a volunteer contact person outside the camp – maybe you? A new network across Denmark is working to reach out to the rejected asylum seekers, and at this meeting we introduce to the project and conditions for people living in departure camps in Denmark. At the meeting you can hear more about what it means to be a contact person, and sign up if you want. A warm welcome to CAMP's new exhibition "Economy of Migrant Labor – for the Right to Work," – a solo exhibition by the transnational radio collective The Bridge Radio. The opening takes place this Friday, 6 pm – 12 am, in Trampoline House and its art gallery CAMP – we have a great opening program planned for you! Made in collaboration with a group of 12 people, who have asylum status, residence permits, and homes in Southern Europe, but often end up living on the street in Copenhagen in their search for some kind of work, the exhibition takes a closer look at the precarious living conditions for migrant workers in Denmark and their struggles for rights. The exhibition takes the form of a large sound installation with sound statements from the 12 collaborators accompanied by photos and graphic works. Click here to read more about the exhibition. Free guided tour in The Bridge Radio's exhibition "Economy of Migrant Labor – for the Right to Work"
This Saturday from 3–4 pm, we offer a free guided tour in CAMP's new exhibition "Economy of Migrant Labor – for the Right to Work". The exhibition runs until May 19. CAMP opening hours: Tuesday, Wednesday & Friday 1–6 pm, Saturday 2–5 pm (closed every last Friday and Saturday of the month). Free guided tours Saturdays 3–4 pm (last Saturday of the month closed).